If I'm gonna die, I want to die comfortable. ''War is a drug''. These four words open The Hurt Locker and form the over-arching thesis of the rest of the film, which makes the bold argument that, whilst war may be Hell, some soldiers, and people who watch war films, get a kick out of it. Staff Sergeant William James (Jeremy Renner) is a bomb disposal expert newly assigned to an E.O.D. (Explosive Ordinance Disposal) unit that identifies and disarms improvised explosive devices in Iraq. The other members of his team, Sergeant JT Sanborn (Anthony Mackie) and Specialist Owen Eldridge (Brian Geraghty), are still mourning the death of James' predecessor, whose death has necessitated James joining them when they have only 38 days left on their rotation. They develop suspicions about James and worry that his recklessness will get one or all of them killed in action. Mark Boal, the screenwriter, was an embedded journalist who spent time with actual bomb disposal experts in Iraq. Unsurprisingly, his screenplay makes for an unflinchingly realistic story, one that is combined with an unconventional narrative. When I say ''unconventional'', I don't mean in terms of narrative structure, more in terms of narrative drive. There is no villain in The Hurt Locker, there is no great task that the squad have to complete in order to triumph, no arc for them to experience. Instead, the film concerns itself with detailing the day-to-day lives of men doing the most dangerous job in the world in the worst circumstances imaginable. This worm's eye view of the war makes for a fiercely apolitical film that may surprise people who have come to expect sloganeering from their Iraq War films, be it in the form of lecturing (Lions For Lambs), righteous indignation (Stop-Loss) or full-blown anger (Redacted). Boal and director Kathyrn Bigelow do not choose to address the bigger questions of the war since when films try to tackle a human story against a political backdrop the politics often swamp the humanity. It is to the advantage of the film that it eschews the political avenue it could have traversed since it makes the interaction between the three principle characters all the more engaging. The pre-existing relationship between Sanborn and Eldridge, along with their prior trauma, makes their relationship with James strained before he's even gone out on patrol with them. Once he starts taking risks and ignoring orders, the tension between them reaches breaking point and makes for some of the films quieter, most powerful moments. However, the emphasis on dynamics and the day-to-day highlights the moments in the film when the script veers off in directions that are at odds with itself. There are a number of plot strands in the film, most notably a late-night sortie, that seem to have been put in to beef up the action quota in the third act, something that the film doesn't need and which only serves to distract. 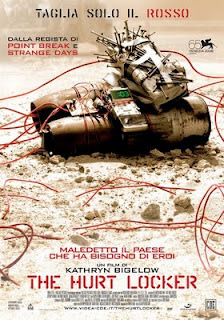 This sequence reveals a common misconception about The Hurt Locker; Kathyrn Bigelow’s presence has led many to pigeon-hole it as an action film, a label that is terribly misleading. Whilst there are action sequences, including a suitably explosive opening and a gunfight that takes place over several miles and the course of an entire afternoon, these are exceptions rather than the rule. It would be more accurate to describe the film as a suspense film, since that is what much of its scenes consists of. Every time that James suits up and approaches an I.E.D. the film pulses with a barely suppressed energy as we expect an explosion to tear through the characters at any moment, creating and maintaining a pitch of unbearable tension. It's not a film about things blowing up, it's a film about things not blowing up. As these scenes mount up, we understand the quote that opened the film; war is a drug, and James is an addict. Whilst the high-pressure of the task at hand wears on Sanborn and Eldridge, James revels in it, and finds it hard to function without the constant adrenaline rush he receives from deactivating bombs; nothing in his life offers him the elation he gets from his job. It's a startling realisation, both for him and the audience, and just one of the many facets that make The Hurt Locker a strong contender for the best film of the year.